You’d think between building up for Star Wars: Episode VII and prepping Gravity for theaters later this fall, Abrams and Cuaron, respectively, wouldn’t have time to dawdle in television. But not only did they help create Believer, Cuaron co-wrote and directed the pilot episode, and Abrams is working on Almost Human for Fox. These guys like to stay busy, that much is for sure. 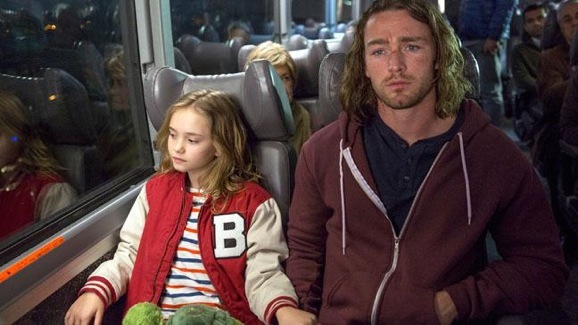 Given Abrams’ well-known penchant for secrecy, we already know a decent amount about Believe. A man named Tate (Jake McLaughlin), who comes with the requisite troubled past—he’s recently been released from prison—must step into the protector role. His ward is a young girl named Bo (Johnny Sequoya). In seven years powers will manifest in Bo that will allow her to defeat all evil, but until then, she’s just a little kid that Tate, along with the help of a mysterious network, must keep safe. Much like the support network in the show, the remainder of the cast should be able to lend a hand to the main characters from time to time. Delroy Lindo plays a man with the ominous name Winter, who, along with his assistant Channing (Jamie Chung), steps in with assistance when Bo and Tate are in a particularly sticky bind. Sienna Guillory plays an icy assassin, who reportedly has some serious mommy issues. I’ll be curious to see how that manifests. Kyle MacLachlan (Twin Peaks, Dune) and Arian Moayad (The Following) round out the credits. Overall this sounds like it could be a cool premise for a show. You can imagine Bo and Tate, forced to constantly move from place to place. Just when they’re starting to get comfortable and build a life, time to go. That adds one narrative level to the idea, and when you take into account the coming of age dynamics, large scale conspiracy, and dark forces at work, there are rich themes and subject matter for Believe to play around with. We’ll see how the show balances all of these elements, as well as see what impact Friedman’s departure has, when we finally set eyes on it later this year. And they wouldn’t just set up home in a bunker because….? Sarah Conner chronicles minus the terminator.